A Veuve Cliquot champagne-infused cocktail perfect for toasting at brunch. 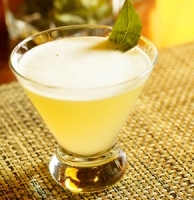 Muddle pineapple and Thai basil leaves to a paste in a dry mixing glass, add tequila, lime, and sugar. Shake vigorously, and strain into a martini glass. Top with Veuve Clicquot, and garnish with a Thai basil leaf. what is p for the instructions ?